Head to the ocean floor and play Sunshine Reef Slots. With cute underwater creatures and a relaxing vibe, Sunshine Reef Slots offers loads of winning opportunities and a buried treasure bonus round! Go on an underwater adventure and win up to 5,000x your wager at Sunshine Reef Slots! The reels are filled with adorable creatures from the ocean floor – Starfish, Seahorses, Pufferfish and more! Get 3 or more of these cute creatures in a row and win big! 5 Starfish in a row pays 5,000x your bet! Spin three or more Treasure Chests in a row and you’re off to the bonus round! Choose from three mystery treasure chests and uncover your prize. After every win you have the choice to double your winnings with the gamble feature. 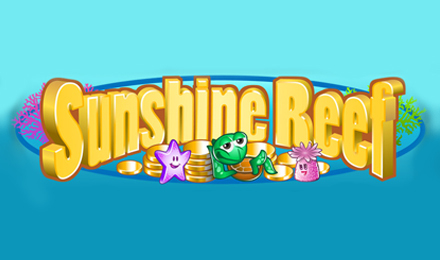 Have fun playing Sunshine Reef Slots and good luck!